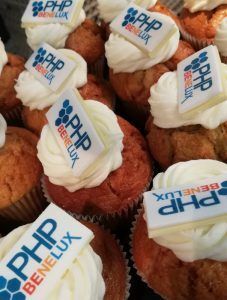 PHPBenelux has just celebrated its 10th anniversary! It has already been 10 years since the first big day of the PHP programming language was held. From a small conference organised by the local community, which attracted 150 participants from Belgium, the Netherlands and Luxembourg, PHPBenelux has now grown into an international event, spread over 2 days. As usual, this 10th edition of PHPBenelux was held in Edegem, and the conference on 25 and 26 January was once again completely sold out. As in previous years, Combell, which has been supporting the PHP community for years, was a “gold sponsor” of the event. The Combell team was well represented: Stijn and Romy livened things up on the Combell booth, Jachim gave a talk, while Maarten, Rein and Jens came as participants to deepen their knowledge. And this year, Thijs Feryn helped as a volunteer in the organisation. A tenth anniversary is a time for some nostalgia. And exhibitors did not need much encouragement to stick to the retro theme of this latest edition. Combell, which is celebrating its 20th anniversary this year, combined the retro theme with birthday presents. 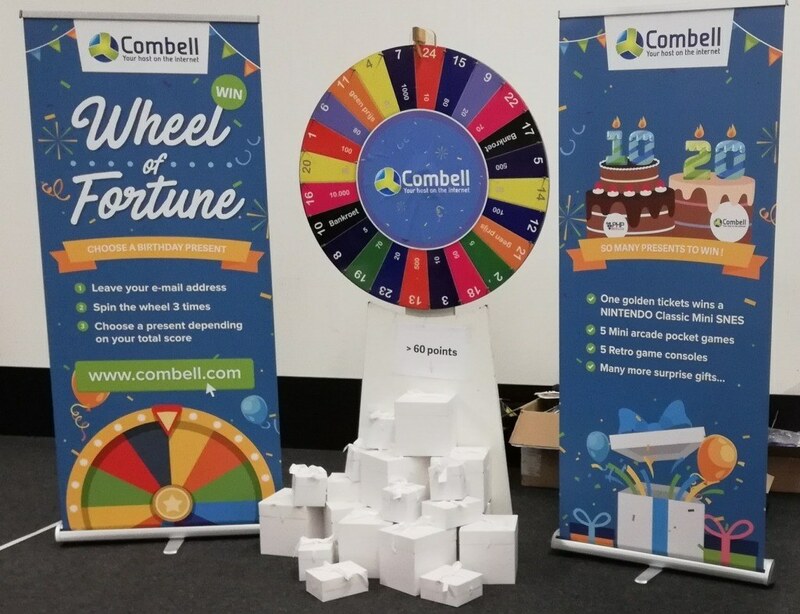 Visitors who turned the Wheel of Fortune on the Combell booth were offered a gift of their choice based on the points they had scored. The mini arcade games, the retro game consoles and the grand prize (a Nintendo Classic Mini SNES) were all received with great enthusiasm. We hope all the winners will have lots of fun! The booth of Cu.be and In2it, which together provide expert training in PHP via Techpath, was transformed into a vintage classroom, including an old chalkboard and school desks. Intracto went for a retro race track, with a geeky twist though: time was traced using a laser above the finish line, which was made with a 3D printer. As for our brand new colleagues at Nucleus, they used virtual reality to allow participants to break blocks with light sabres inspired by Star Wars. Instead of regular trophies, the winners were rewarded with cardboard Stormtroopers. 10 years PHPBenelux, and 20 years Combell: it is a double celebration! A lot of fun with the retro games and, as ever, extremely compelling presentations. Of course, the ‘pinball machines’ had to be part of this event, as well as many arcade games on the various stands. Nintendo, the living proof of the retro hype in the gaming industry, was very much present. But “analogue” games also appealed to our gaming fans: darts, boxing games, air hockey, pool tables, four in a row... and of course the now traditional bumper cars, which were a big success until the late hours. 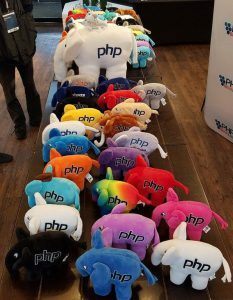 There is no such thing as an anniversary without presents: the goodie bag contained an elePHPant, the much coveted PHP gadget that people love to hunt every year. This special version with the PHPBenelux logo and the ‘10 years of conferences’ tagline embroidered on it will surely find a nice place in any collection and will be a great addition to the group photo of the next few years. Oh! Right; with all the entertaining activities organisers had planned, you would almost forget about the key events, but of course, there were also many interesting presentations. Developers and PHP experts shared their knowledge on the latest developments and revealed how they solve certain problems. Combell colleague Jachim Coudenys gave a presentation on Consuming API's. Based on our experiences in-house, he explained how best to deal with an overload of APIs. Our own experiences with Kubernetes were also discussed, in a small unconference room though, where Maarten Steenhuyse shared his wisdom with a small circle of privileged people. By the way, Maarten will soon take the floor at the Docker event that will be held in our Ghent premises (on 12 February). 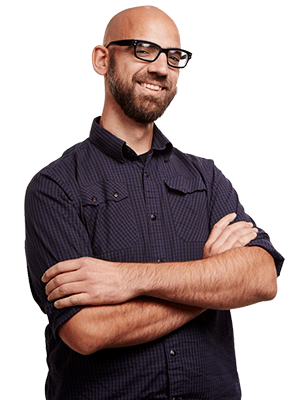 He will be there to give a joint talk with Thijs Feryn: “A Container Workflow for Application Developers”. It is great to see how the PHPBenelux meetings keep proving how strong the community is, and how the many developers are willing to share their experiences without expecting anything in return. And for us, it is very satisfying to be able to tell our Combell story there as well. We are already looking forward to welcoming you at the next PHPBenelux Conference! Be careful as Brexit could cause you to lose your .eu domain! Thijs gave his 200th presentation!